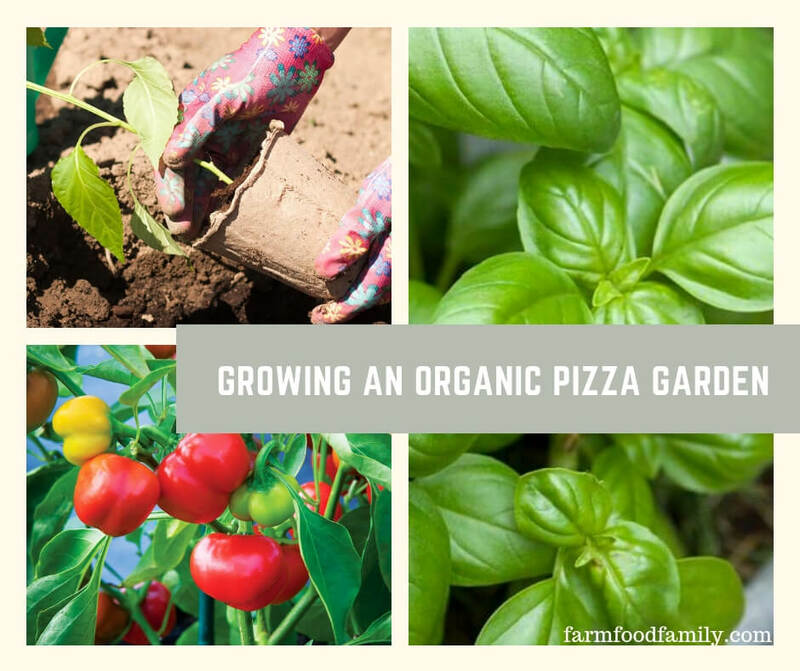 Few pizza chains offer pizzas with organic toppings, but home gardeners can grow a natural pizza garden in a sunny back yard spot. A pizza garden is a good theme garden for beginners, children, or anyone who loves pizza. Filled with fresh organic vegetables and herbs, this garden will produce all summer long. Organic gardeners can emphasize the destination of the harvest by planting the pizza garden in a circular plot, with each wedge dedicated to a specific ingredient. Place a 4-foot string on a stake, and walk in a circle around the stake, marking the perimeter with sand or nontoxic spray chalk. Divide the circle into four or six wedges, depending on the number of plants to be installed. The best tomatoes for the pizza garden are Roma tomatoes, which have the fewest seeds and pulp. Many Roma tomatoes are determinate, which means they produce bushy plants rather than space-hogging vines. Limit the use of nitrogen-rich fertilizers such as blood meal, which encourage leafy growth at the expense of fruit. Organic gardeners can interplant tomatoes with marigolds to attract hover flies, which prey on aphids. Pesto basils like ‘Gevovese’ add a characteristic spicy aroma to pizza, either as a chopped topping or as a sauce ingredient. Greek oregano is a classic herb to use in pizza sauce. Although basil and oregano both like well-drained soil and full sun, oregano is a perennial while basil is a tender annual. The most problematic insect pests for basil and oregano are whiteflies, aphids, and mites. Gardeners should resist using even organic sprays to control these pests, as all parts of sprayed herb plants are meant for consumption, and even nontoxic sprays impart a foul taste. Instead, blast aphids and mites away with a jet of water, and employ yellow sticky cards to trap aphids. Organic gardeners who grow onions at home can forgo the extra-hard varieties meant for long-term storage that grocers carry. A sweet, mild variety like ‘Walla Walla Sweet’ makes an excellent pizza topping. Elephant garlic is a mild choice for the pizza garden. Garlic and onions require soil without rocks, excessive clay, or a high saline content. Gardeners shouldn’t use too much manure on these bulb crops; otherwise they risk attracting the onion maggot. Garlic and onions don’t fare well in acidic soil conditions, so gardeners may need to add lime to raise the soil pH above 6.5 if the soil is acidic. Rotate garlic and onions to a different segment of the pizza garden each year to avoid disease buildup problems. Gardeners can grow a mix of mild and hot peppers in the same area, as all peppers thrive under similar growing conditions. Like tomatoes and basil, peppers pout when the soil isn’t warm enough, so delay planting until night temperatures are at least 60 degrees. Slugs prey on new pepper transplants, but beer traps keep the infestations to a minimum. Tomatoes and peppers are in the same plant family, so organic gardeners should rotate these crops to a different part of the garden each year or at least plant different varieties from year to year.